Using high pressure and temperature to improve material performance, the Quintus 15L press features a new modular design that shortens installation time and reduces space requirements. A Quintus Technologies hot isostatic press (HIP) will round out the line-up of high-tech equipment in the 10,000-square-foot metal additive manufacturing (AM) center recently opened by Sintavia, LLC, in Davie, Fla. 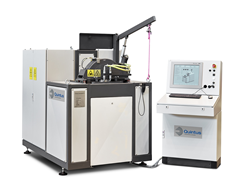 The model QIH 15L press will give Sintavia serial production capability for metal parts that meet the exacting quality control standards required by the aerospace and defense industry. “Without HIP technology, additively manufactured parts are susceptible to porosity and lack of fusion. HIP allows for near 100% net-density parts,” states Sintavia founder Brian Neff, who recognized the promise of AM, also known as 3D printing, during a long career in aviation and parts manufacturing. The press for Sintavia is equipped with Quintus’s proprietary Uniform Rapid Cooling (URC™), which, by incorporating densification and heat treatment in the same equipment, shortens cycle times for higher productivity. The QIH 15L will play a key role in allowing Sintavia’s aviation customers to respond to the mandate to compress build-to-fly time. The press features a hot zone capability of 7.3 x 19.7 inches (186 x 500mm), enables pressures up to 30,000 psi (207 MPa), and handles temperatures up to 2550°F (1400°C). Its new modular design shortens installation time and reduces space requirements. It is delivered as a complete unit, with gas compressing system, cooling unit, transformers, electrical cabinets, and pressure vessel all mounted in a 103 x 73-inch skid. The press, fully pretested in the Quintus workshop, will be shipped from Västerås, Sweden, in July. It will be commissioned and up and running in September 2016. “Building and maintaining long-term relationships is of the highest importance in our daily business, and we warmly welcome Sintavia into the Quintus customer family,” Mr. Söderström concludes. Founded in 2012, Sintavia provides metal additive material manufacturing solutions, including serial production and mechanical/parameter development. The company’s state-of-the-art facility in Davie, Florida, offers on-site metal additive manufacturing via the powder bed fusion process, as well as metrological and metallurgical testing. Sintavia is committed to secure, quality production of metal parts that meet or exceed the exacting standards of the Aerospace & Defense (A&D) industry, and its customer base includes both A&D OEMs and Tier One suppliers. Read more about Sintavia at http://www.sintavia.com.